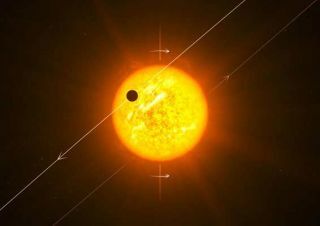 The exoplanet WASP-8b is shown here with a complete retrograde, or backwards, orbit. Several extrasolar planets have been discovered to be orbitingbackwards ? that is, they revolve in the opposite direction that their hoststar rotates ? challenging accepted ideas of how planets form, according to theastronomers who made the discovery. "This is a real bomb we are dropping into the field of exoplanets,"said team member Amaury Triaud, a Ph.D. student at the Geneva Observatory inSwitzerland. The team announced the discovery of nine new transiting exoplanetstoday at the annual meeting of the Royal Astronomical Society in Glasgow,Scotland. Transiting exoplanets are ones that were discovered as they passed infront of their host star from the perspective of Earth, causinga dip in the light coming from that star. When the new results were combined with earlier observationsof 18 other transiting planets, the astronomers were surprised to find that sixout of that larger sample of 27 exoplanets were orbiting in the oppositedirection of the rotation of their host star (called retrograde motion) ? theexact reverse of our own solar system. Astronomers firstdiscovered a backwards-orbiting exoplanet in August 2009. The new finding suggests that astronomers might have torevise some aspects of planet formation. Planets are thought to form in the disc of gas and dust thatsurround a young star. This proto-planetary disc rotates in the same directionas the star itself, and it was thought that any planets that formed out of thedisc would revolve in their orbits in that same direction. The planets found in the new study are so-called hotJupiters, which are Jupiter-sized planets that orbit very close to theirparent stars, experiencing extreme temperatures. It was originally thought that hot Jupiters formed far fromtheir star and migrated inwards over a few million years as a result ofgravitational interactions with the disc of dust from which they formed. Butthis theory doesn't account for the new observations, the team said. How do 'hot Jupiters' form? To explain the retrograde motion of the six exoplanets, thehot Jupiters may have migrated in due to the gravitation tug-of-war betweenthem and more distant planetary or stellar companions over the course ofhundreds of millions of years. After these disturbances have bounced a giantexoplanet into a tilted and elongated orbit it would suffer tidal friction,losing energy every time it swung close to the star. It would eventually becomeparked in a near circular, but randomly tilted, orbit close to the star. "The new results really challenge the conventionalwisdom that planets should always orbit in the same direction as their star'sspin," said team member Andrew Cameron of the University of St. Andrews inScotland. In two cases, the retrograde planets have been found to havemore distant, massive companions that could have caused the migration. These planetary wanderings also have implications forlikelihood of finding Earth-like planets in these systems. "A dramatic side-effect of this process is that itwould wipe out any other smaller Earth-like planet in these systems," saidDidier Queloz, also of Geneva Observatory.